Getting familiar with a new city can feel daunting. On our first visit to Lisbon, Portugal’s capital and largest city with half million inhabitants, we were unsure where to start. Determined to explore the city like a local, we set out to taste Lisbon food, one neighborhood at a time. A hilly city on the banks of the Tagus River, The Queen of Sea (as it’s nicknamed) is best explored on foot and using its old-fashioned trams and buses. This way, we steered clear from guidebooks and stumbled onto restaurants where locals eat using our own flair for finding authentic food experiences. Along the way, we stopped at popular venues known for authentic Portuguese and Lisbon food. 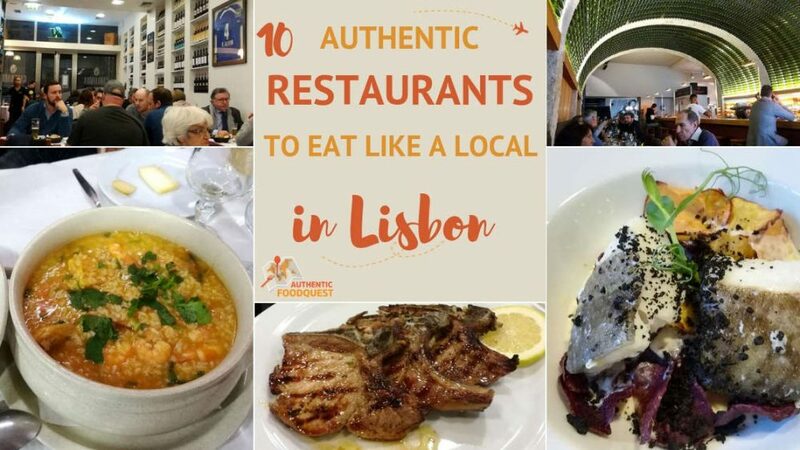 With this food guide, let’s explore Portuguese cuisine through these #10 authentic and local restaurants in Lisbon. 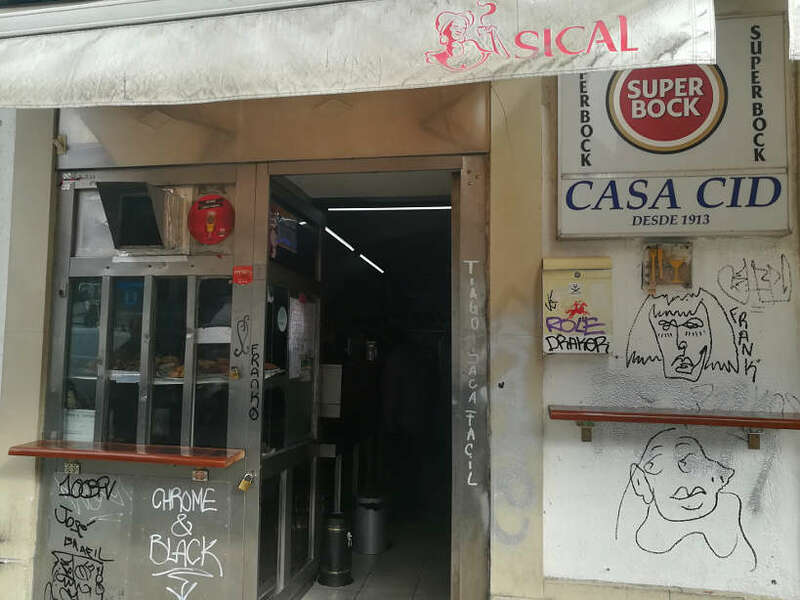 Almost every evening on our way to our Airbnb in Penha de França, located just east of the tourist-crammed Alfama neighborhood, we walked by this local restaurant we walked by this local restaurant always busy with locals. We learned that this restaurant is known as a steakhouse of excellence, using the best local meats, cooked the Portuguese way. You can choose your beef, lamb, or pork, and the restaurant will prepare it perfectly for you. Besides the meats, you’ll also find a variety of fresh fish from the ocean. Salad is complimentary and the quality is excellent. On our last night in Lisbon, we stopped in for dinner. Since we didn’t have reservations, we were led to a table in the middle of the already buzzing restaurant. Claire chose to have bacalhau assado na brasa com batata a murro or roasted codfish prepared with potatoes. This was one of the Lisbon food we had been told to have by a Portuguese friend and had missed. The fish came in an impressive plate that could have served three people. Although beautifully presented, the cod was lacking in taste and the texture was less than tender. Rosemary picked the pork ribs or costeletas de porco preto. This was definitely our preferred dish. These perfectly cooked ribs were juicy, flavorful and very tender. Paired with a bold red wine from the Alentejo region, this was a wonderful culinary match. What to have for dessert is Portuguese chocolate cake. Dense, with a gooey chocolate center, it was best savored in small bites. 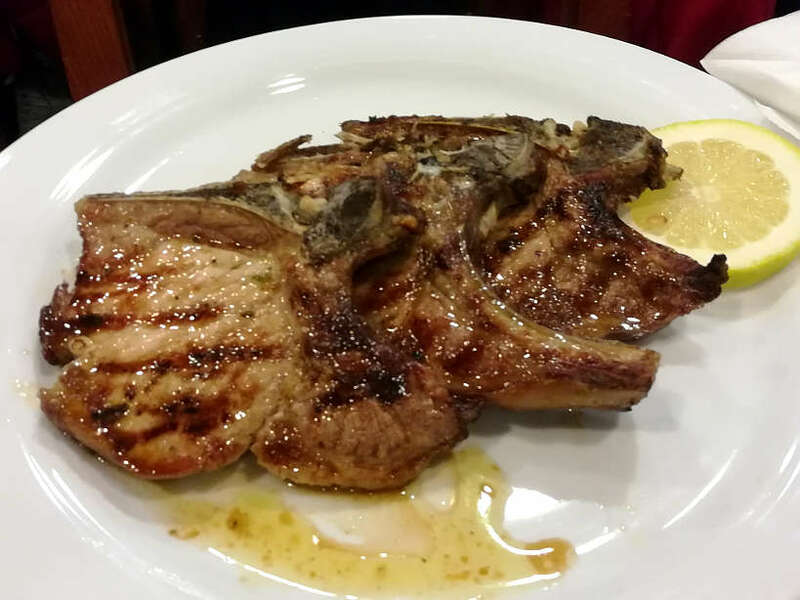 For a typical Portuguese dinner at a Lisbon restaurant where locals eat, head to Carvoaria Jacto for their amazing meats. Pro Tips: Skip the bacalhau and instead get the porco preto or other Portuguese typical meats. Reservations highly recommended. Huge portion sizes. Go hungry or plan to share. The first indication this was a local restaurant was the lack of a menu. There was nothing in English and only a slogan of the local beer with unrecognizable dishes was written in large letter on the windows. 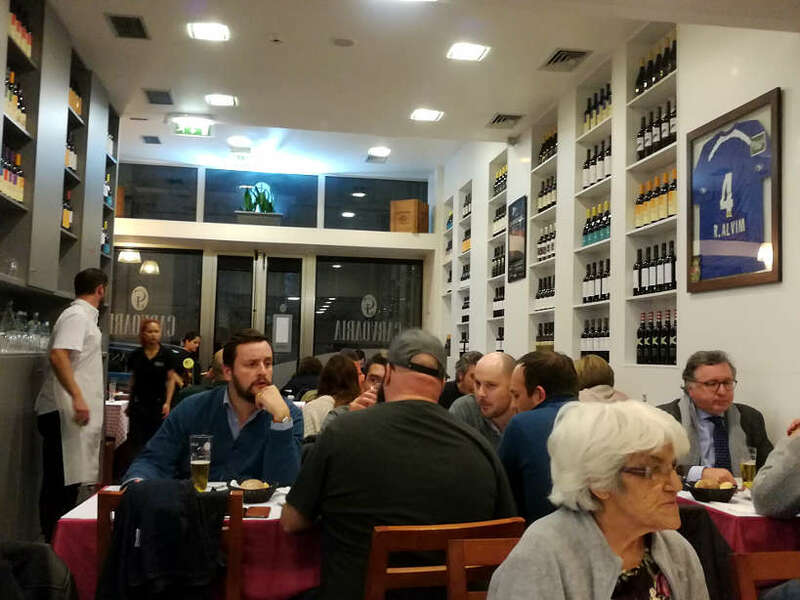 This was our first night in Lisbon when we discovered this no-frills restaurant. Intrigued by the animated crowds sharing tables and the busy waiters, we stepped in feeling a little out of place in the very local environment. However, the warmth and delectable scents of meat sizzling was an invitation to stay. The tables were packed in the middle of the week, though we found a table right by the entrance. This local restaurant specializes in fish and grilled meat. Once seated, the friendly waiter brought the menu and the traditional couvert with bread, cheese, olives from the Alentejo region and homemade butter. We chose the traditional Portuguese arroz de mariscos or seafood rice stew, a hearty dish for a cold January dinner. 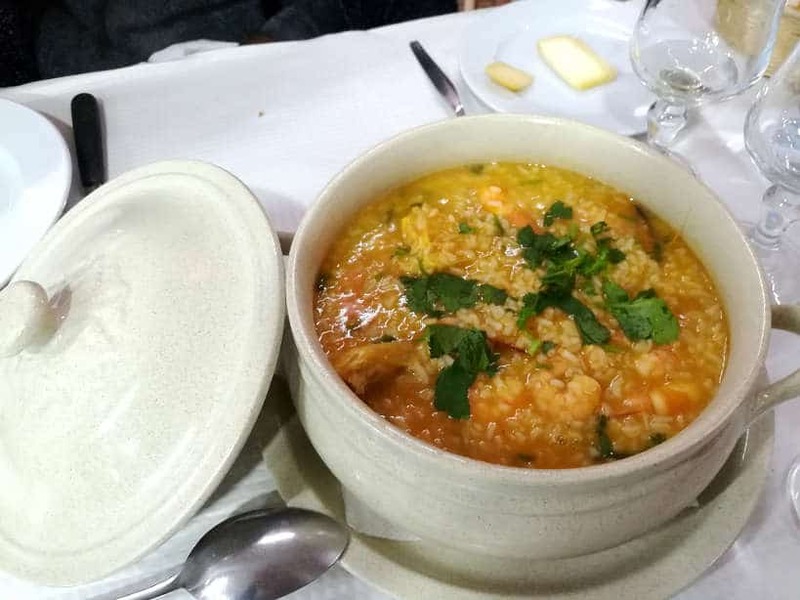 This Lisbon food came in a large bowl, perfect for two to share. The rice was served with a mix of shrimp and clams in their shells, covered with cilantro and a light tomato-based sauce. Without any hesitation, we joyfully slurped up this soupy rice dish. With the fresh seafood and fragrant herbs, this was the perfect homestyle dish for a winter night. Located on the top of the hill leading to the Graça neighborhood, this local restaurant is tucked away from the tourist attractions. 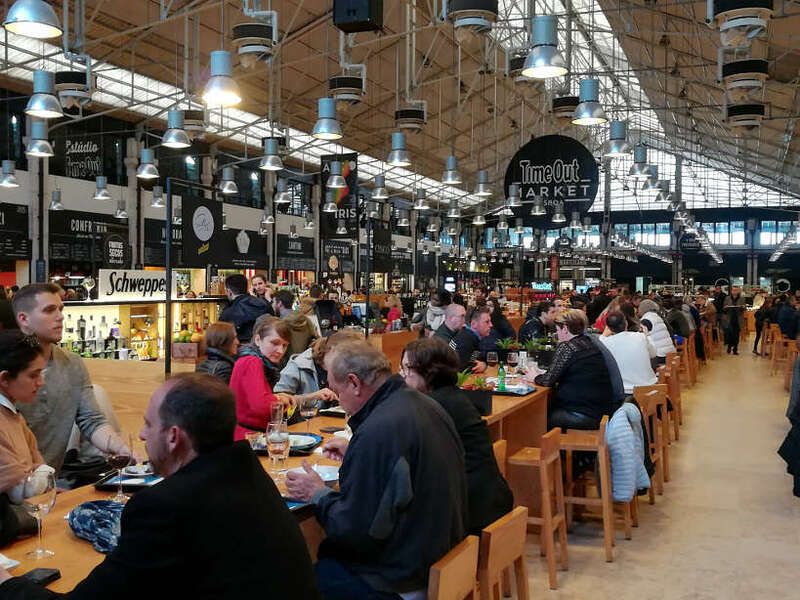 Attached to the Lisbon food market, Mercado de Sapadores, you’ll not miss the large glass windows with the Super Bock beer sign. Pro Tip: In Portugal, you don’t have to pay the couvert if you don’t eat it. However, this local restaurant had some of the best couvert we had in Portugal, with fresh bread and artisanal cheeses. So for this one, feel free to dig in! Walking back from the Museu do Azulejo, the national Portuguese tile museum, we struggled to find a local restaurant open on a Sunday afternoon. Luckily, we stumbled onto this restaurant near the Santa Apolonia train station in the Alfama neighborhood. 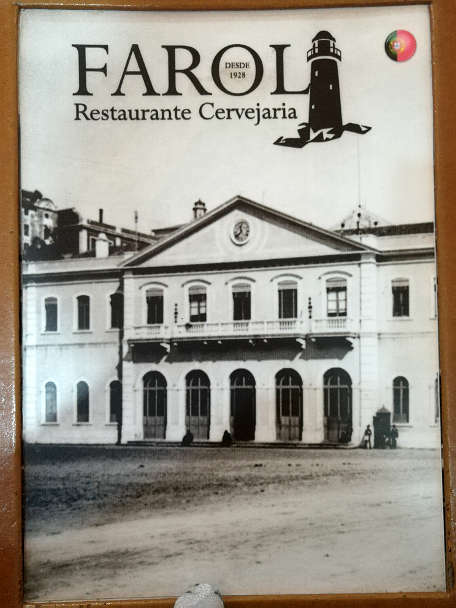 While restaurants near train stations are never the best choice, too tired to walk any further we decided to give Farol a chance. This restaurant had the typical Portuguese atmosphere, simple and traditional. The bar counter occupies the main stage, with a few tables spread out in the length of the restaurant. There is additional seating outside, which we could imagine busy on sunny days. This style of cooking includes boiled or baked potatoes that are smashed, salted, and tossed with seafood in olive oil with cilantro or other herbs. The surprisingly tender octopus and potatoes that tasted of the earth made for an enjoyable experience. Rosemary, dreaming about grilled sardines, chose this typical Lisbon food. Simply prepared, the generous sardines were served with boiled potatoes. Simple, delightful and filling, summarizes the overall experience at Farol. The service is rather slow. We went on a Sunday afternoon and were not rushed for time. If you are catching a train at the nearby station, plan for plenty of time in advance of your departure. 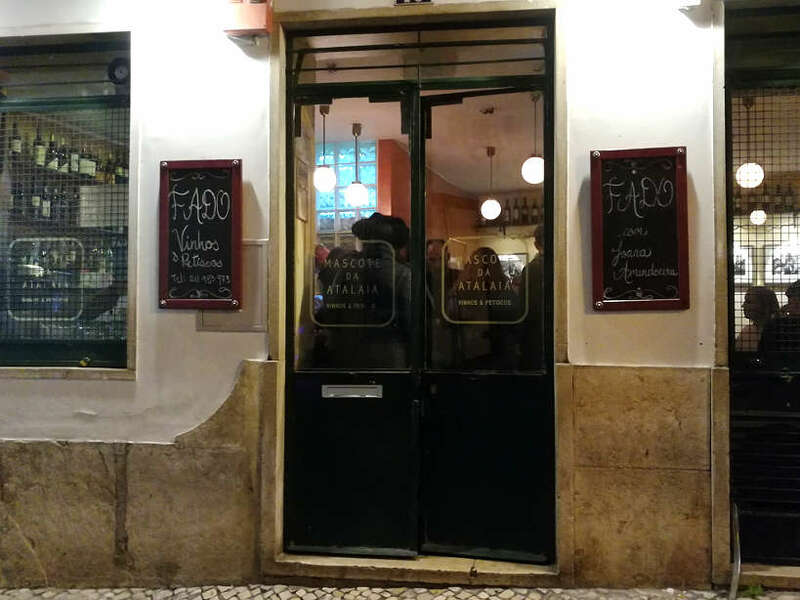 Prices are slightly higher than at other local restaurants in Lisbon. This is also a great spot to stop for a thirst quenching local Portuguese beer, like Super Bock. Have you heard of Fado? Fado is the soul of Portugal and its symbol. Fado now on the Unesco list of cultural heritage, is a musical style originating in Alfama and Bairro Alto, Lisbon old neighborhoods. Today, Lisbon visitors throng to listen to Fado, a music with melancholic tunes and lyrics. Ironically, it is now performed at well sought-out places, whereas originally you could only hear it at infamous bars where the city’s poor and sailors gathered. At Mascote da Atalaia, the local and intimate atmosphere stays true to the origin of Fado. Space is limited and tables shared. You go there to listen to Fado with a serving of petiscos and wine. The night we went to Mascote da Atalaia, a solo Fadita or Fado woman singer, was accompanied by an acoustic guitar and the pear-shaped Portuguese guitar. We decided to go beyond the petiscos and try the Fado menu. This simple menu included a starter, main dish, dessert as well as wine and coffee. To start, we both had the hearty caldo verde soup. To follow, Rosemary had a grilled tuna dish with peppers, while I savored the classic Portuguese stew with peas, chorizo and a fried egg on top. To finish, Rosemary had the pudding with the Ginja, Portuguese sweet cherry liquor, we enjoyed on our Lisbon Food Tour. And, I was in heaven with the marbled looking chocolate salami dessert made with rich chocolate and crunchy Maria biscuits. While simple, the dishes were tasty and full of flavor. The portions were reasonable and we were happy with the options presented. If you want to listen to Fado, away from the tourist crowds, we the recommend the local Mascote da Atalaia. Pro Tip: To guarantee a seat at this intimate restaurant, make reservations ahead of time. Listen to Fado all evening, while you enjoy the moderately priced menu at 25 euros (approx $29), wine and coffee included. The Portuguese have their own version of Spanish tapas, called petiscos. Like tapas, they are also small bites, but generally small versions of large plates. Petiscos are an important part of Portugal’s gastronomy. Enjoyed in social settings, petiscos generally consist of sardines, codfish or bacalhau, local sausages, regional cheeses, all washed down with delicious Portuguese wines. 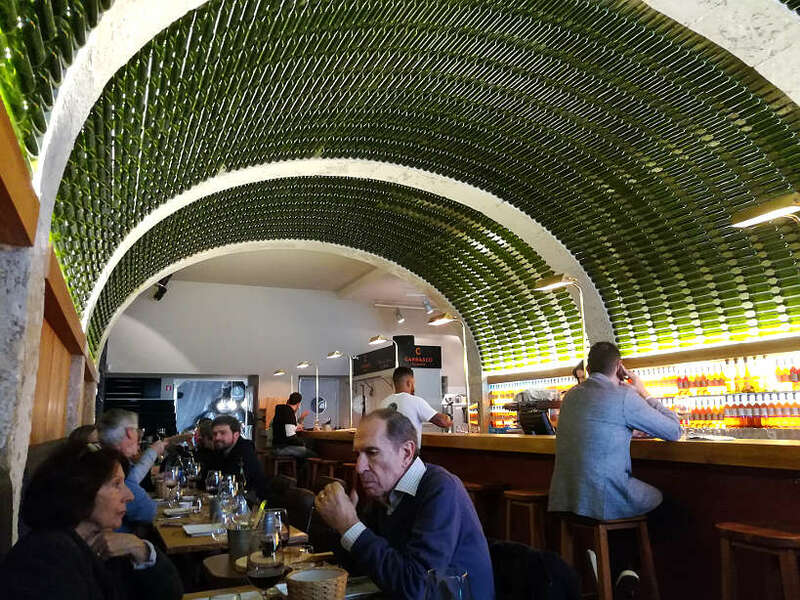 One of the best places in Lisbon for petiscos is “By The Wine José Maria da Fonseca.” Situated in the trendy Chiado neighborhood, this is the flagship store of the famous Portuguese wine maker José Maria da Fonseca. Wine lovers will enjoy spectacular Portuguese wines from around the country. To cure a little hunger one afternoon, we stopped in for petiscos. Accompanying two refreshing glasses of white and rosé wines, we savored a variety of local specialties. The black pig Iberico ham and other cold meats paired perfectly with bread from Algarve. Many local cheeses are available as well as delicacies from the sea like salmon ceviche and mussel salad. By The Wine in Lisbon is the best place to go to taste Portugal’s famous petiscos. Pro Tip: Great place for atmosphere and a nice selection of Portuguese wines. Ask the knowledgeable staff for recommendations on the local wine. 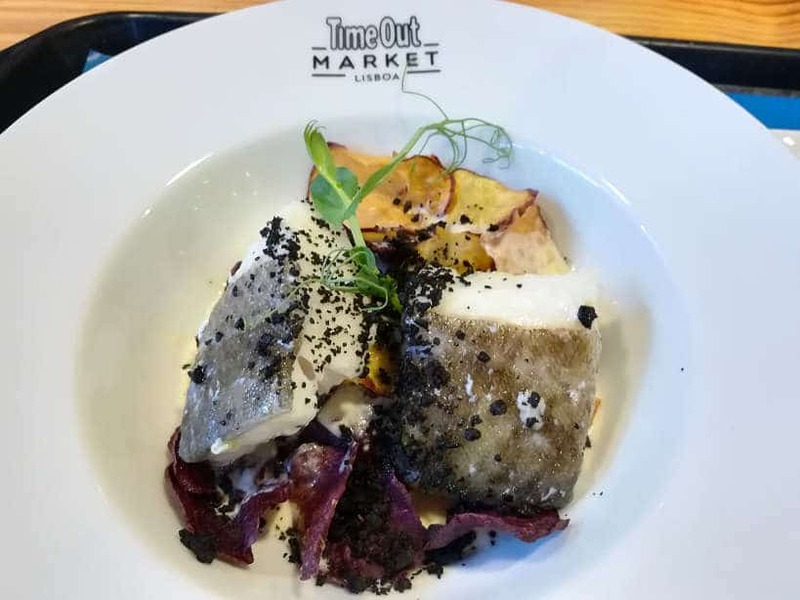 The Time Out Market in Lisbon has become one of the most visited and talked about culinary spots in the city. Since it’s opening in 2014, the food hall attracts hundreds of visitors and locals on a daily basis. 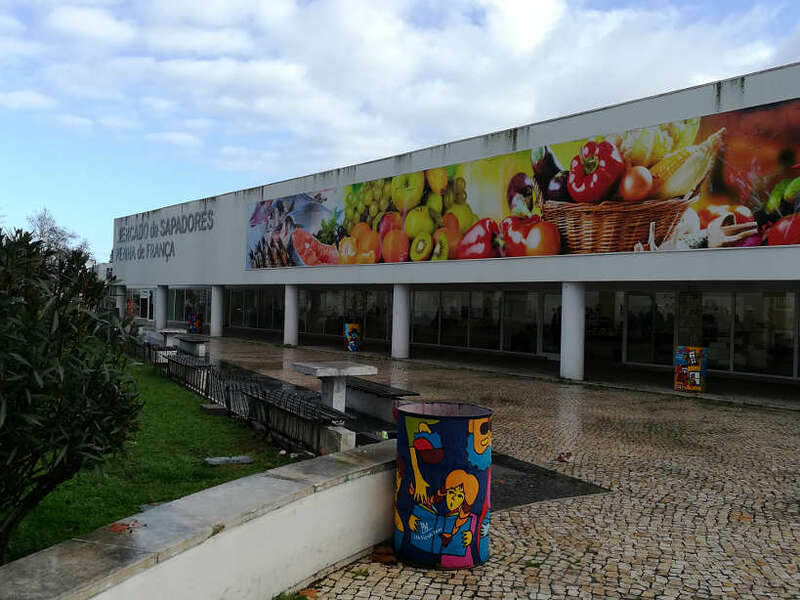 The canteen-like food hall has several stalls offering a variety of local Portuguese food, drinks, desserts, and products. On one end are stalls from a few Michelin-star chefs representing different regions of the country. All around are dozens of stalls selling regional specialties. In the interior of the large open room are communal tables, perfect for those eating in groups. Wines from different regions of Portugal as well as craft beers were also available in the center. For a sample of the national cheeses and dry cured meats, visit the Manteigaria Silva food stall, the city’s best charcuterie store. At chef Susana Felicidade’s stall, Cozinha da Felicidade, you’ll be treated to a creative adaptation of bacalhau, Portugal’s national dish. Bacalhau com Natas, which is divinely prepared codfish with sweet-potato chips and olives, will leave you wanting more. The name of her stall means “Kitchen of Happiness,” and that is exactly how you feel as you savor the fresh, tender and delicate flavors. Pro Tips: At the peak hours at lunch and dinner, finding a space to eat at this Lisbon food market can be challenging. Go during the off hours for a more relaxed experience. Located at an inconspicuous corner at the back of the Mercado da Ribeira, Casa CID is the kind of place that you can easily walk by. Far from the hip and modern feel of the renovated Time Out Market, this corner restaurant takes you back in time. Graffiti “decorates” the rundown entrance and you won’t find any tourist. Instead, locals sipping on a beer while eating traditional Portuguese food congregate there. From the outside, you’ll see the food displayed from the window. Several plates, each containing different types of fried food waiting to be served. 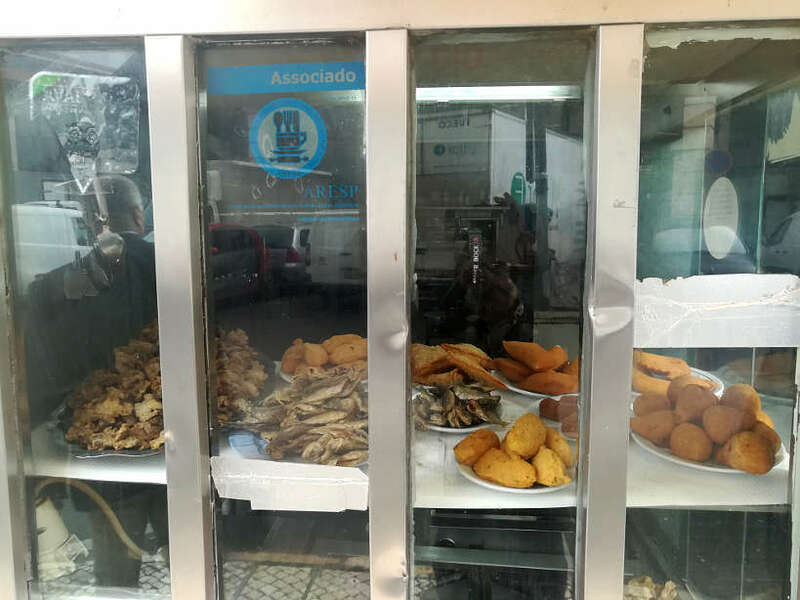 Fresh grilled sardines, pasteis de bacalhau, and other traditional foods entice passerby to stop in. Unfortunately, we didn’t get the chance to venture inside and get the full experience of this local eatery. It is definitely on our list for our next visit to Cais do Sodre. We stumbled onto Madragoa Café while looking for another local Lisbon restaurant. We were immediately seduced by the warm and cozy environment and Cristina’s welcoming smile. 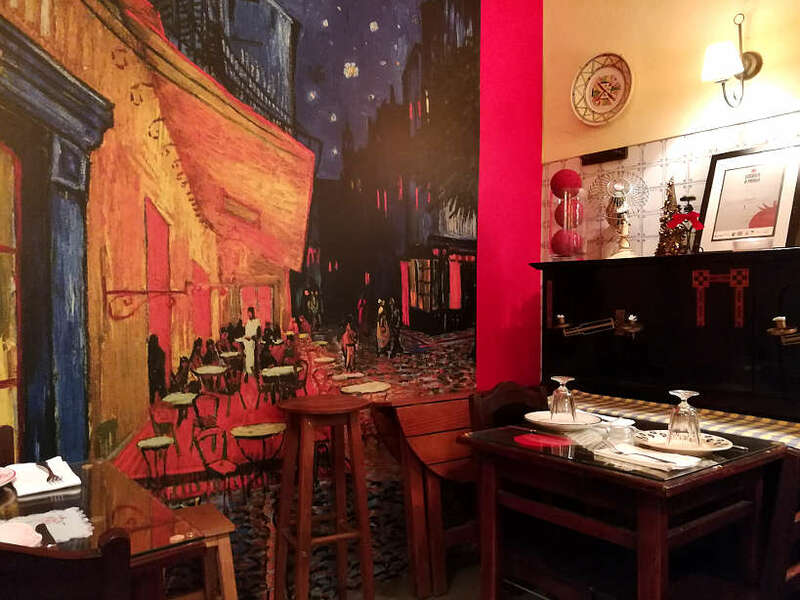 Seated next to a huge painting of Van Gogh’s “Café Terrace at Night” we perused the menu which featured Portuguese regional and homestyle cuisine. With a focus on the local specialties, we ordered the restaurant’s signature dish, bacalhau Madragoa. As Cristina brought the dish to the table, she proudly talked about her Portuguese heritage and her unique approach to Lisbon food and Portuguese cuisine. 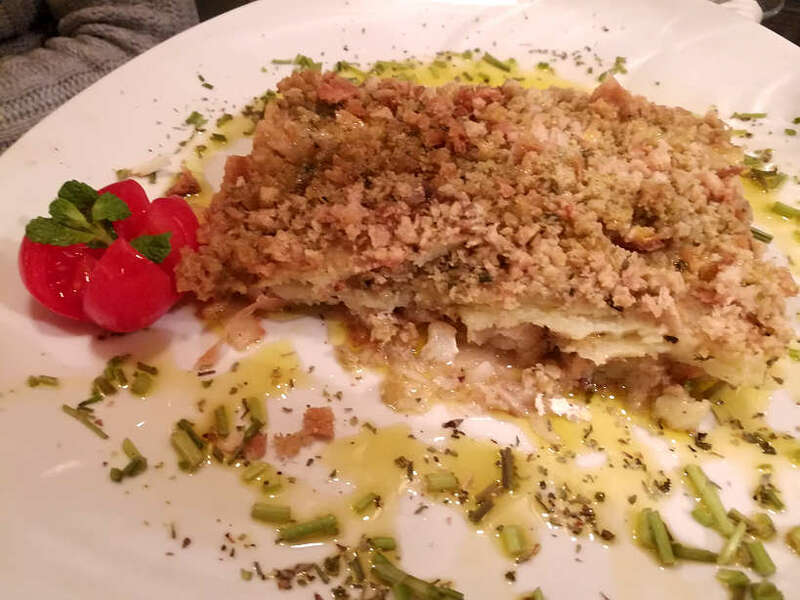 The dish, she told us “puts a twist on the traditional Portuguese bacalhau or codfish.” The beautiful dish combines melt-in-your-mouth cod with sliced and breaded potato sprinkled with olive oil, and a variety of delicately scented herbs. The end to a perfect dining experience closes on something sweet. At Madragoa Café, you’ll find a flavor for every taste. While tempted by the decadent chocolate cake, we opted for a traditional almond cake. The morgado da guia, an almond tart with a chocolate base, was the quintessential finale. For where to eat in Lisbon, at a local restaurant that feels like home, venture out to the Santos neighborhood for a taste of Portugal’s regional classics. Pro Tip: For the best experience, ask Cristina for her personal recommendations. You’ll not be disappointed. A short tram ride away from central Lisbon is the Campo de Ourique neighborhood, an area rarely visited by tourists. This neighborhood is known to locals as a foodie haven, where new concepts are tested and launched. 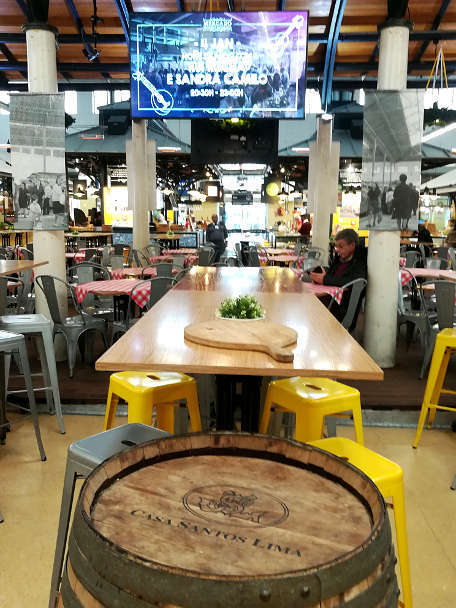 In the core of the neighborhood is Mercado de Campo de Ourique, a food market with a variety of stalls, selling fresh produce, fresh fish and meats. Alongside are stalls serving Portuguese tapas or petiscarias, a variety of Portuguese dishes, drinks and more. Petescaria – 2 à Esquina, located in the middle of the food hall offers small bites with a touch of modernity. Small dishes that can be eaten in a small frying pan, accompanied by bread, are the main focus. 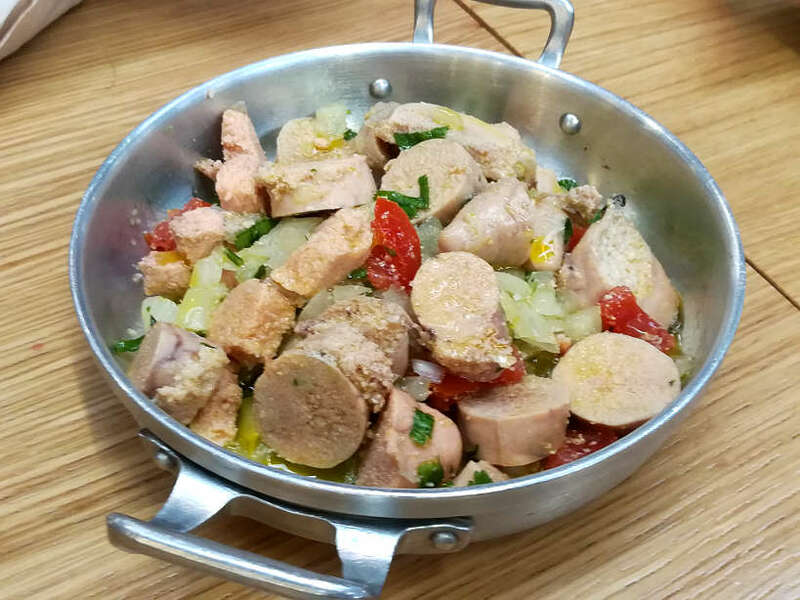 Expect to find mackerel, chorizo, farinheira (Portuguese sausages) and a variety of salads. If you are willing to taste the flavors of Portugal, where most tourists don’t go, this historic market that opened in 1934 is a treat. Pastéis de nata, or pastéis de Belém (Belém is the suburb of Lisbon where they were created) are egg custard tarts that were created by monks in a Belém pastry shop in 1837. These desserts are the most iconic and famous Portuguese dessert. While you find pasteis de nata at almost every Pastelerias or pastry shop, a trip to the original Belém pastry shop is a must. Made by Monks who were expelled during a revolution in 1820, selling the pastries was a way to make money. Shortly, the pastries became very popular with local visitors after a small store attached to a sugar refinery started selling them. Today, the store Fábrica de Pastéis de Belém has preserved the traditional recipe. So popular, the store bakes over 10,000 tarts per day for visitors seeking to taste this unique traditional recipe. This is the only store that can sell these pastries under the name Pastel de Belém. The puff pastry-like dough is made with lots of butter folded into the layers. Small pie shells are filled with the egg custard preparation and then cooked in a very hot oven. 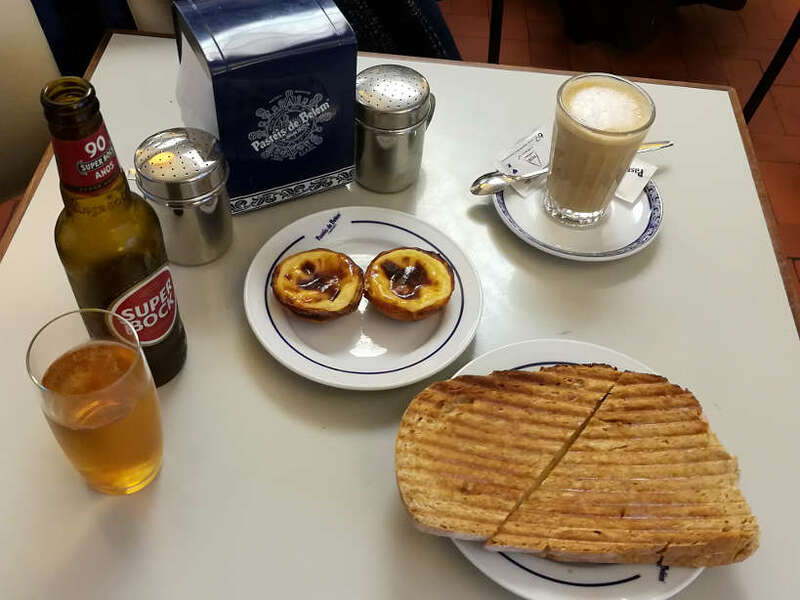 Pastéis de natas are served warm with a strong cup of Portuguese coffee, called bica in Lisbon. Besides pastéis de Belém, you can also find savory options. The hot ham and cheese sandwiches called tostadas are our personal favorites. You’ll also find quiche, croissants and more. Lisbon has established itself as one of Europe’s hippest destinations. With a thriving tourist scene, comes tourist trap restaurants and trendy food concepts. Portuguese and Lisbon food is simple and flavorful and impeccably prepared. 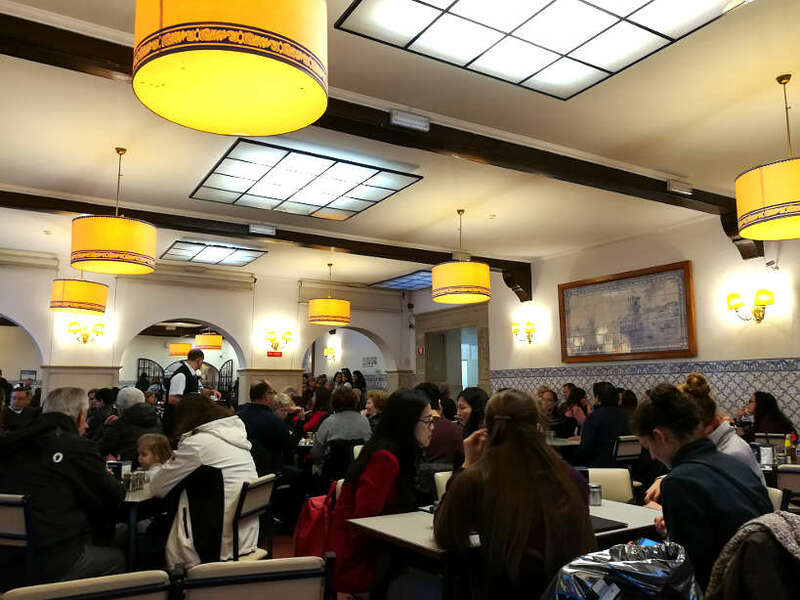 If you are unsure about where to eat in Lisbon, go where the locals eat. Explore the city and use this Lisbon food guide to find the best Lisbon restaurants where locals eat. Do you have a favorite place to eat authentic Portuguese food in Lisbon? 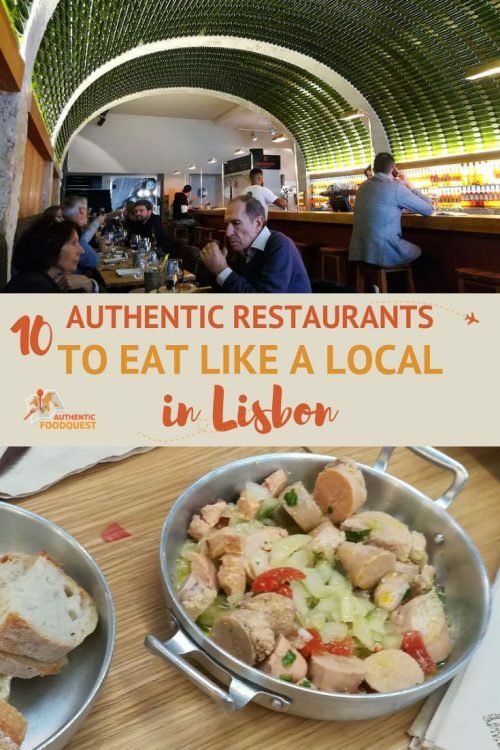 In the comments below, please tell us your favorite place to eat Lisbon food. Find out What kind of food traveler are you? Take the quiz and get your food traveler profile in minutes! Our preferred neighborhoods for a local food experience in Lisbon are Penha de França and Campo de Ourique. Very local, both these neighborhoods are easily accessible to and from the main venues and tourist attractions in Lisbon. Staying with locals via Airbnb is a great way to learn about the local food culture. We had a great experience at Cristina’s Airbnb and recommend her place highly in the Penha de França neighborhood. In Campo de Ourique, we visited the Hotel da Estrela and found it charming and serene, away from the bustling capital city. With a contemporary decor, this hotel offers basic amenities including free wi-fi, private bathrooms with walk-in showers and more. The hotel restaurant serves traditional Portuguese cuisine including the famous conventual desserts. There is also a private garden where you can relax with a glass of wine. You’re in close proximity to restaurants and shopping and getting around is easy. Book a tour with our partner, Get Your Guide and get more from your stay in Lisbon. Simply click below and book your tour online. I definitely believe that eating at locsl restaurants of any country is the best way to learn about their culture and at the same time interact with the locals. That’s a bummer to hear you struggled to find good local Portuguese food. It is abundant!! Yes, indeed, keep this list for your next trip to the Lisbon and be prepared to have an amazing time! There are so many great restaurants to eat at in Lisbon and the food is amazing. We ate a few times at a place called Faco & Garfo just of Largo do Carmo square the food was divine. So true, so much good food in Lisbon. Have not heard of Faco & Garfo, will check it out the next time we are in Lisbon. Thanks for the tip. Try the ones of this list for a delicious local experience. I’ve always wanted to visit Portugal and this post only reinforces it. Macau has very similar egg tarts so I wonder how the ones from Belem taste! It is quite fascinating how the Portuguese exported their food around the world. We haven’t had the egg tarts from Macau and it would be wonderful to compare and contrast them side by side. Thanks for stopping by, Nicholas. The authentic food all looks so delicious, my mouth is watering reading your post, thanks for sharing! What a fantastic list! Every single spot made me think, “mmmmmm….get in my belly!” Ha! Thank you for the resource for Lisbon! You are most welcome Mary. Please feel free to share it with folks you know who may be going to Lisbon. Cheers! What great restaurant choices for dining out in Lisbon. The food looks fabulous! Wow… what an unique bunch of restaurants and more importantly, what unique dishes! I can’t imagine most of these dishes but the Octopus with potatoes takes the cake I think! But yes, whatever place you visit, you must eat like a local, otherwise there is no point in going that far. You are so right, eating where locals eat makes for a unique experience, but it is always surprising how many travelers stay in their comfort zones!! I’ve heard many great things about the Time Out Market, but you provided a lot of other choices too! Everything looks delicious. Great to here Stine. There is more to Lisbon than the Time Out Market. Hope you get there soon to check out the other spots! I’ve never been to Lisbon, but I have been to Porto and the north of Portugal. I wasn’t so impressed with the food for the most part, but it looks entirely different in Lisbon. I love octopus and it’s something I only get rarely. The pea and chorizo stew looks delicious, too, and I think I’ll even try to make something like that at home. 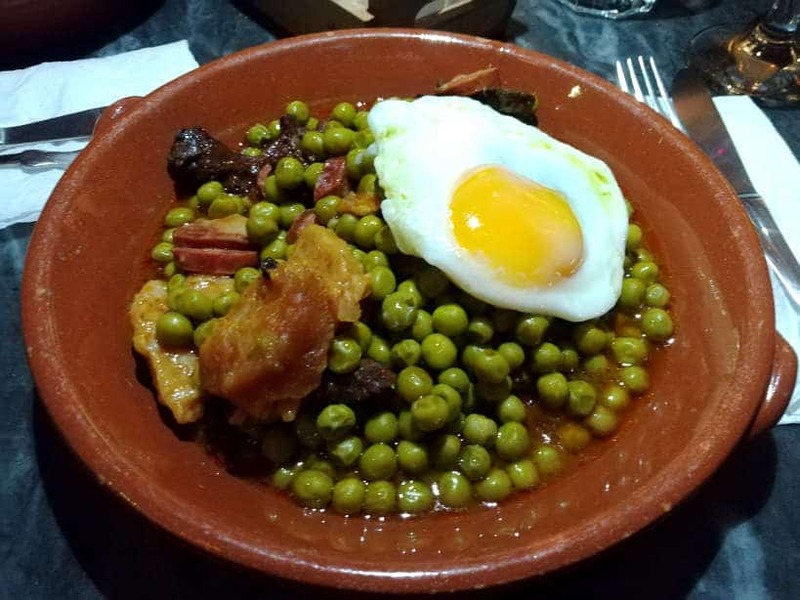 Thanks Jennifer, so glad this article gave you a new appreciation for Portuguese food 🙂 The pea and chorizo soup was surprisingly tasty. Let us know how it goes when you make it at home. Thanks for stopping by! These restaurants sound great and the dishes you showed are all mouth-watering. I love baccalau with potatoes. Too bad you didn’t like it! Thanks Carol. Actually, we really enjoyed baccalau with different variations of potatoes. This one particular experience did not measure up to all the previous ones, hence the disappointment 🙂 Great local restaurant all the same. Thanks for stopping by. I’m such a foodie and would love to go to Portugal one day – all the food looks awesome! Thanks for your comments, Cassie. Indeed, hope you get to Portugal soon. You’ll enjoy all the amazing cuisines!! What a comprehensive list of great restaurants to choose from in Lisbon! As a traveler, it is so hard to know where to go, especially if you need to watch your budget but still want some authentic food. The trick might be figuring out what is actually authentically Portuguese. So true, finding local authentic restaurants is always a challenge. 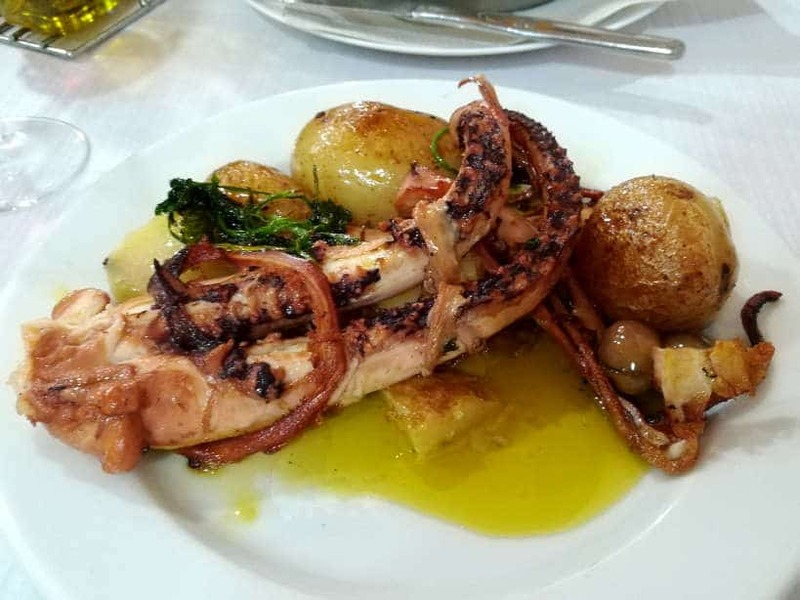 We hope this Portuguese food guide will help travelers to Lisbon skip the tourist traps and have amazing and affordable authentic Portuguese food. Thanks Tami. Bookmarked! I’m headed to Lisbon soon and can’t wait to eat all the food. I’d hate to waste a single meal at some tourist trap. Thanks for the great research. You are most welcome, Leah. Do let us know what restaurants you end up trying and what you think. Safe travels and have fun! I love Spanish tapas but I didn’t know Portugal had their own version in petiscos! Glad to hear that they are more like mini versions of full-on meals, more chances to try everything! The vaulted ceiling at By the Wine looks amazing, I love the effect the stacked wine bottles give the room. And it makes you want to drink more wine to get a bottle up on the ceiling! A bottle of wine, a Fado song, and a big chunk of delicious meat, Portugal sounds amazing! Thanks for sharing! 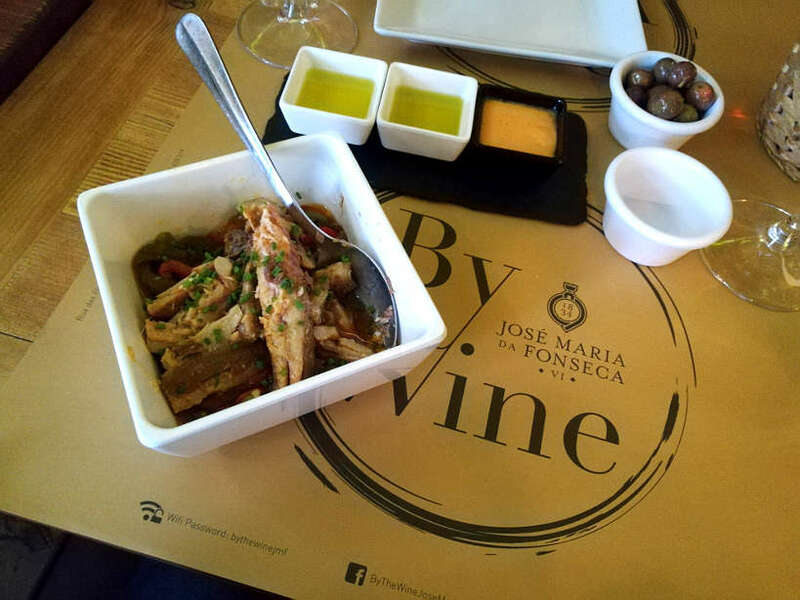 We were also surprised, at first, to see some similarities between Spanish cuisine and Portuguese food. Portugal has its own unique and delicious twist to the food. We also totally loved the design at By The Wine. A truly amazing place to check out when you get to Portugal. Appreciate your comments, Stevo. We’re headed there next spring so this is absolutely timely and perfect! Can’t wait to visit Lisbon! Perfect timing. That’s awesome. Do check out these restaurants and let us know what you think. Great city, you’ll enjoy Lisbon. Cheers. I have never been to Portugal, but a trip to Lisbon seems like it is a must for foodies. Of course I’ve heard of the Pastéis de nata, but didn’t realise they had the alternate name pastéis de Belém. I would love to try them from their suburb of origin! I’m not a huge fish fan, but couldn’t leave without trying the codfish, since it is such a signature dish! You’ll find so much amazing food in Portugal. Beyond the fish, the pork is award winning. The beef is excellent as well. There is a meal for every flavor. Hope you get to Portugal soon and savor some of the delightful bites. It is indeed a country with amazing food. Thanks for stopping by. I’ve read so much about Lisbon recently that I’m geared to go. As a South African meat eater, I think I’ll head to Carvoaria Jacto first come dinner time. Wouldn’t mind listening to Fado at Mascote da Atalaia either. Awesome to hear Linda, at Carvoaria Jacto, skip the fish and go for the meat specialties. No doubt you’ll find a few surprises. Hope you make it to Lisbon soon. Cheers. 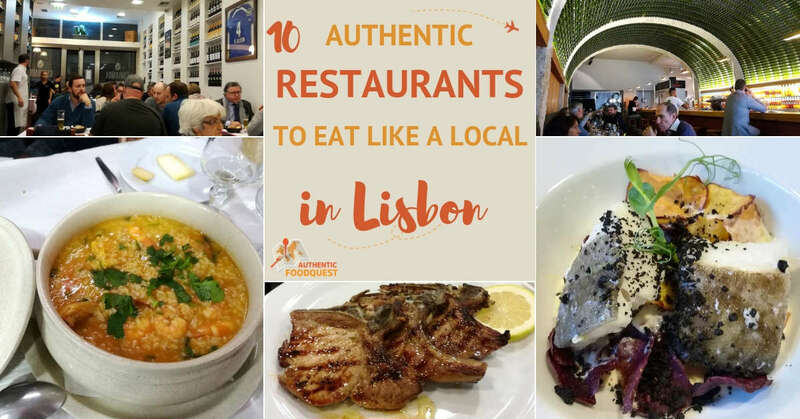 What a fantastic list of places to eat in Lisbon! I’m planning a trip around Europe next year and I think I will put Lisbon on my list! The Lisbon food market would be my pick but I’m sure I’ll have time to check out a few more. Definitively don’t miss Lisbon on your travels around Europe. You’ll be delighted by all the food options, even beyond the Lisbon food market. Keep this handy for your upcoming trip!